Like all good stories, the gathering of these images depicting what a previous version of this article stated was a single cab Jeep Wrangler pickup, happened by breaking some rules. User Mattiek27 posted them to the after taking a trip to the Walter P. Chrysler museum in Detroit, Michigan and then taking a drive around FCA campus. Here Mattiek27 spotted an interesting looking truck and managed to snap a few pictures before security chased them out of the lot. Initially the forum stated that the two-door truck seen in these pictures was likely a test mule for a single cab version of the Wrangler pickup, but that was soon dispelled when a source at Jeep reached out to the forum to make corrections. Apparently, the images we feasted our eyes on and satiated our imaginations with is actually a Jeep J8. The J8 is a military spec Wrangler built in Israel and Egypt by partners contracted by FCA. 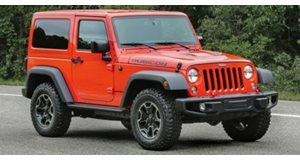 Previously the thought that these images gave evidence that the Jeep Wrangler pickup would come in at least two cab flavors: crew for the majority of the truck-loving population and single for the blue collar Wrangler fans. This past July, our spy photographers the former of those two Wrangler pickups out testing in the badlands, but the Wrangler we see here wearing only a fresh coat of snow as camouflage helped convince us that a single cab version was going to come to fruition. Even though the bed is covered up with a soft top, there is a suspicious lack of rear windows and rear door seams. Usually this would point to the two-door Wrangler SUV, but the rear end on this example is too long to be a two-door model. Furthermore, as JWF member Wolfslash16 pointed out, there are leaf springs installed on this Wrangler, adding more fire to the possibility that this Wrangler has a bed rather than an enclosed rear end. Unfortunately, that speculation was wrong, which at least answers the question regarding Jeep's motivation for building a single cab version of the truck that would likely sell poorly. On the other hand, the fact that Jeep has a military-only vehicle that's not from or for the US (wearing Michigan license plates, mind you) in its parking lot brings up another host of interesting possibilities. One is that Jeep is using the truck to test out powertrain options for the next generation of Wrangler. The other is that Jeep is using the J8 to test out variations on the Wrangler pickup truck as was mentioned before. Either way, the rumor mill will keep on turning. Photos posted to by Mattiek27.